I like playing Madden as much as the next person, but it gets boring after a while because it’s too easy. So I decided to give myself a challenge: build a team around Tim Tebow. I thought about doing this with the Eagles, but I couldn’t bring myself to do so. So instead I will run the Jaguars because if Shad Khan isn’t going to take Tebow then I’m going to make him. I did it and I’m proud of it. But how does one build a team around Tebow? Easy. By surrounding him with players with the highest intangibles, which of course is literally impossible. If it could be rated, it isn’t intangible. That’s pretty much the only criteria I will use. Actually being good is an afterthought. Tim Tebow has to put the team on his back and schlep them to glory 5.4 yards at a time. So I took over the Jaguars in owner mode so that I can’t be fired, and did a fantasy draft. The draft process was remarkably simple: sort by Intangibles, take the highest rated player. In the event of a tie, take the player rated with the highest Toughness. Draft 22 starters plus punter and kicker before drafting any backups. I laughed the whole time. I anticipated having a core of some quality players, likely older ones, particularly on defense that Tebow can take credit for rallying, leading and improving, but for the most part it will be a mediocre team. Filling the Jaguars entirely with small white guys at the skill positions is cliche and unimaginative, but I will wind up with a few of them. Since Tebow is a running back playing QB, it would be a bonus if I put players out of position, such as play a 4-3 with 3-4 personnel or vice versa, I will let the the draft determine my scheme. If a 2nd inside linebacker is rated higher on my board than a 2nd DT, then we’re a 3-4. It doesn’t matter if the players are a fit for scheme, it probably fits the narrative better anyway of a rag tag team rallying around The Messiah. Because the Jags will now be playing good old fashioned 1940s football, the offensive line ideally would be built from the inside out, guards will be more valuable than tackles. I’ll want blocking tight ends and two fullbacks. Skill position players should be scrappy, tough overachievers whenever possible. WRs should be able to run block and catching by TEs is not a requirement. Since so much of Tebow is BS narrative, I think a roster of players that haven’t won anything seems fitting, a few redemption stories will be welcomed if possible too. Give me your tired, your poor, your huddled masses yearning to breathe free. The Prodigal Son hears the adorations of the masses. 1. CB Charles Tillman – This is perfect. Peanut Tillman is the ideal hard nosed veteran that my defense needs, and 32 year old CB as my first pick ensures this team will not be very good. 2. FS Jairus Byrd – I’m going to need playmakers on defense to give Tebow a short field. So far, so good. 3. G Marshal Yanda – Who builds their offense starting with a guard? Team Tebow does. 4. G Evan Mathis – Now I’m openly laughing, back to back guards is a dream come true. 5. C Nick Mangold – The interior of the line is set, welcome to 1940s football. 6. CB Antoine Winfield – Another veteran cornerback. Who needs speed? 7. QB Tim Tebow – At this point I was on my third re-do of the draft because Tebow went higher than expected each time. I grabbed him here to be sure I got him. 8. DE Chris Clemons – My best pass rusher, if we are in a 4-3. As you’ll see, we’re not. 9. LB Sean Lee – Another playmaker. Considering I drafted my entire interior offensive line before I drafted a skill position player, I will need them. 10. LB James Laurinaitis – Highest player on the board at a position not filled. So we’ll be a 3-4. At this point, I was getting a lot of guards, safeties and some middle linebackers, so I had to skip over them and start filling out my starting lineup. 11. DE Chris Canty – Doesn’t fit, doesn’t matter. 12. LB Philip Wheeler – Stick to the board. 14. WR Kenny Britt – If Tebow can’t set him straight, no one can. 15. K Sebastian Janikowski – I nearly spit take. Among other holes in the roster, I don’t have an offensive or defensive tackle. But I have to stick to the board. 16. P Andy Lee – Stick to the board. 17. SS Louis Delmas – Between Delmas, Laurinaitis, Byrd and Lee… do not come across the middle. 19. WR Danny Amendola – Yes! Peyton Hillis and Danny Amendola are starting. I’m overjoyed. I wondered why no offensive tackles had shown up. So I looked at positions individually and discovered the game was misleading me, not giving me all the players. Time to grab some. 23. FB John Kuhn – Got to have a full back. Got to. Actually, got to have two. Now I have a starting lineup, so I can make aesthetic choices if I want. 26. TE Tony Moeaki – Lots of 2 TE sets! 28. S James Sanders – Jim Leonard was available and would be perfect here, but I stuck to the board. I had instant buyer’s remorse. 38. WR Derek Hagan – Good intangibles, toughness and run blocking. Some might consider it a steal. 39. FB James Casey – A 2nd fullback and 3rd tight end in one? Gold. 41. LB Dan Connor – Worst player on the team. Doesn’t matter. Stick to the board. 42. DT Mike Patterson – Winds up not making the team. 44. QB Pat White – Wildcat! 48. 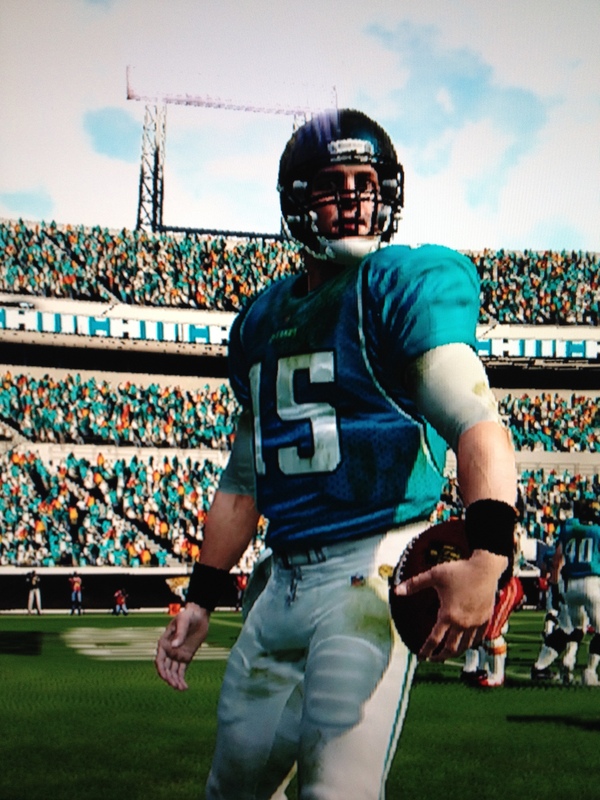 QB Tyler Thigpen – My QBs will be run into the ground. 49. HB Brian Leonard – Another FB/HB. Can’t get enough. 50. RT Jammal Brown – Also does not make the final cut. 51. LB Stewart Bradley – Another pre-season cut. 52. HB Montario Hardesty – I need a running back with some speed. Some. 53. WR Kassim Osgood – Good special teamer, good run blocker. Doesn’t make the final roster. That’s a pretty good defense actually. It’ll need to be if the Jags have any chance of winning, because the best playmaker on the team averages 9 yards a reception. If practice and pre-season are any indication though, this team embodies never say die. On successive possessions they forced fumbles. On 3rd down they get exactly the yardage needed. I don’t know what LeRoy Hoard is up to these days (*Googles LeRoy Hoard, sees he’s not dead*), but he can be a coach. For you kids who don’t know, LeRoy Hoard was a short yardage running back on the late 90s Vikings who once said “if you need three yards, I’ll get you three. 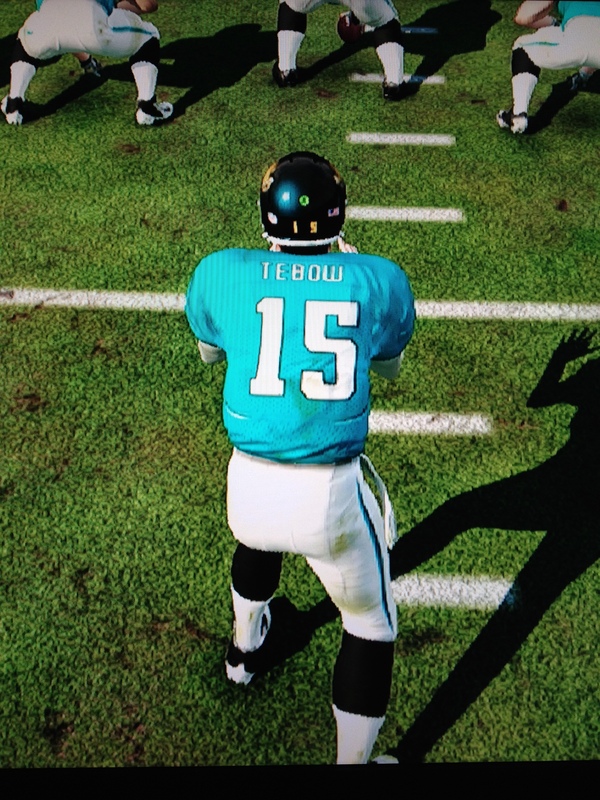 If you need five yards, I’ll get you three.” Tebow ran a guy over at the goal line ala Breaking Madden. But that was pre-season. Now the games begin. 1st Quarter – Kansas City starts with the ball but goes 3 and out thanks to a 3rd down Canty sack. 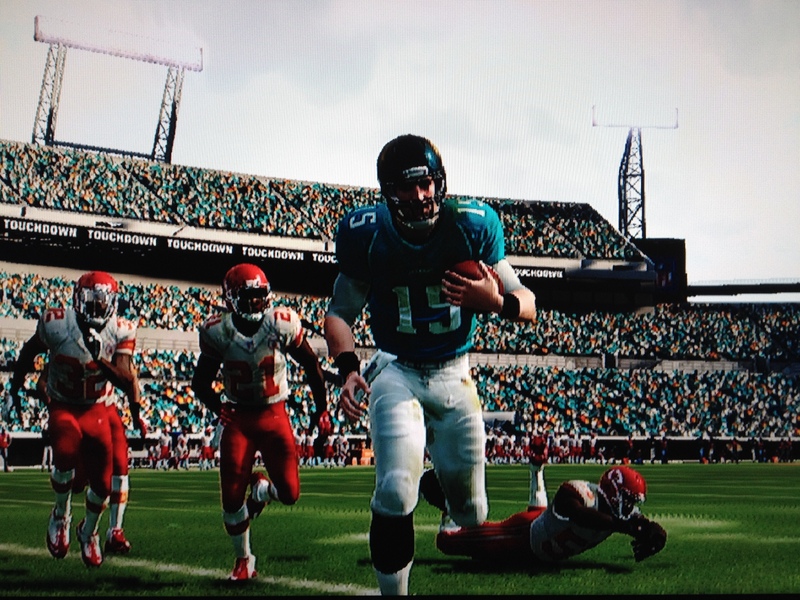 Julian Edleman returns a punt to the KC 7, can Tebow convert? Of course not. Tebow is stopped by Connor Barwin twice on a read option, Gus Bus settles for FG, 3-0 Jags. Ensuing drive, Canty gets another sack on 2nd down, then Tillman picks off Drew Brees inside the 30. Grit. End of 1st, 3-0 Jags. 2nd Quarter – Off the INT, Tebow can’t punch it in again, resulting in another FG. This is just setting up the narrative for later, isn’t it? 6-0 Jacksonville. Brees and Jamaal Charles slash up the defense on the next drive, 7-6 Chiefs. The running Tebows slog down the field, converting 3rd down after 3rd down to take a 13-7 lead on a Peyton Hillis TD. A KC turnover on downs ends the half. 13-7 Tebows. 3rd Quarter – Amendola with a huge return to the KC 31. Tebow knocks Trent Cole out on a read option, but the drive predictably stalls with another FG. Good thing I took a kicker high!. 16-7. Defense forces a 3 and out because they’re gritty, they’re inspired, they’re the most intangible bunch of intangibles that ever intangibled. Another Jaguars drive that starts with good field position and ends with a FG. Can’t make this stuff up, don’t need to, it was the 2011 Broncos season. End of 3rd, Chiefs driving. Touchdown Tebow on the QB keeper! The Chiefs move down the field in a hurry to make it 26-21 but it’s all over but the singing. The Jags recover the onsides kick and that’s game. Sorry Andy. Jaguars 26, Chiefs 21. Just like I drew it up.